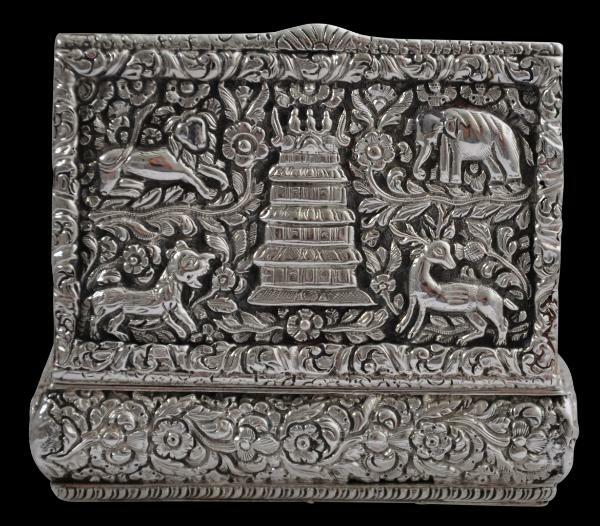 This soild, high-grade silver, double-walled snuff box has been chased on the cover and all sides with the dense tropical vegetation, animal and temple motifs typical colonial Trichinopoly silverwork, which draws heavily on the local motifs and influences of South India. It has an overall ‘pillow form, with rounded edges and sides. 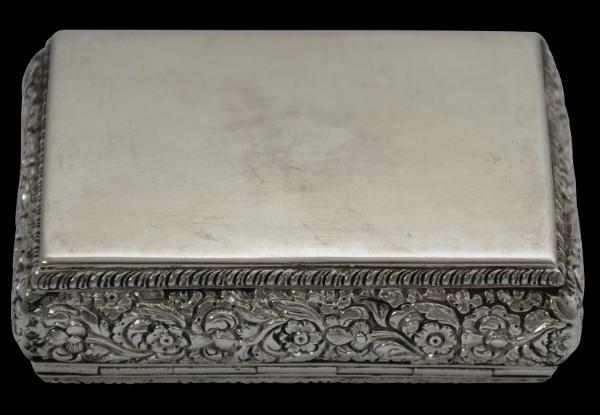 The box is surprisingly heavy-in-the-hand, partly as a result of it being double walled. 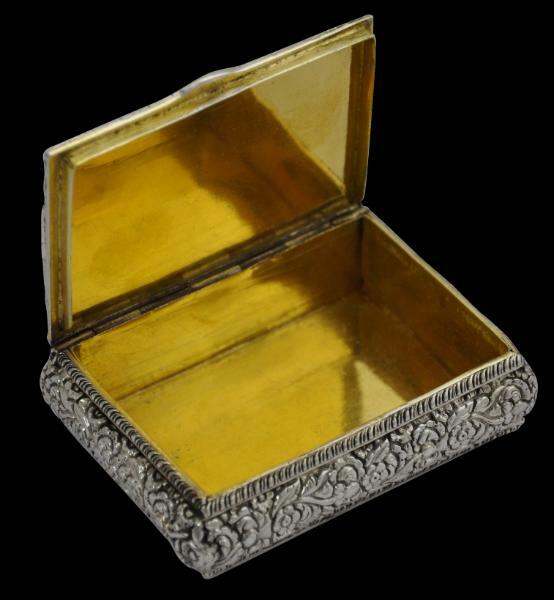 The interior of the box and lid are heavily gilded; gilding which is still bright. 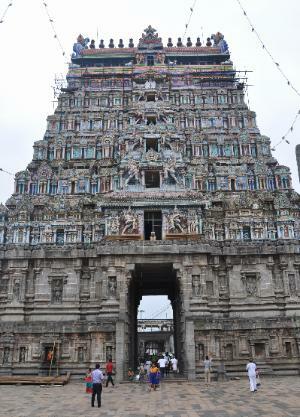 gopuram, a tower-type that is a part of many Tamil Nadu Hindu temple complexes and which is unique to the temples of South India. Trichinpoloy (known as Tiruchirappalli today) is the former French concession of South India. 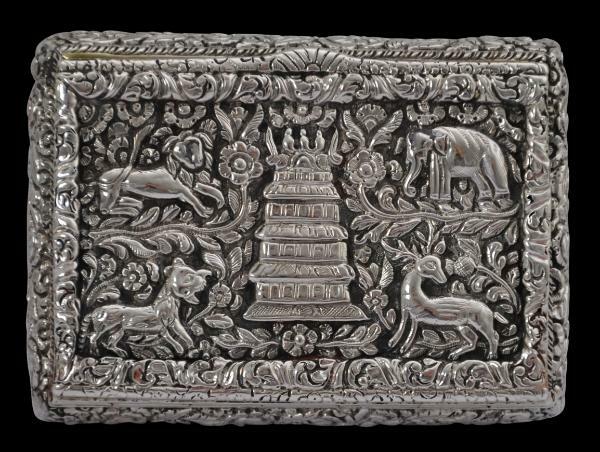 Although less than 350 kilometres from Madras, but under the British East India Company and later, British colonial administration, its silversmiths developed a unique style that incorporated the ‘swami’ style of Madras with incredibly dense and fine floral and foliage relief work. 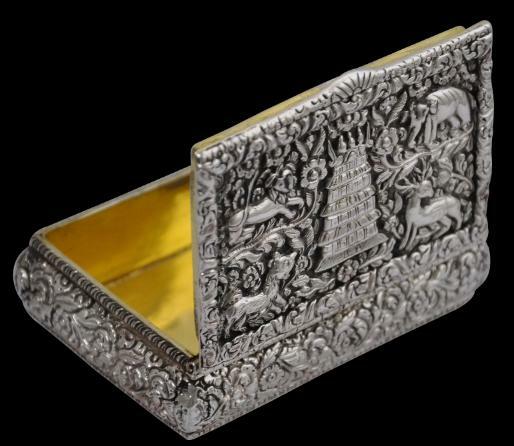 The silver and gold items produced in Trichinopoly tended to be small, luxurious items such as snuff boxes and perfume bottles. 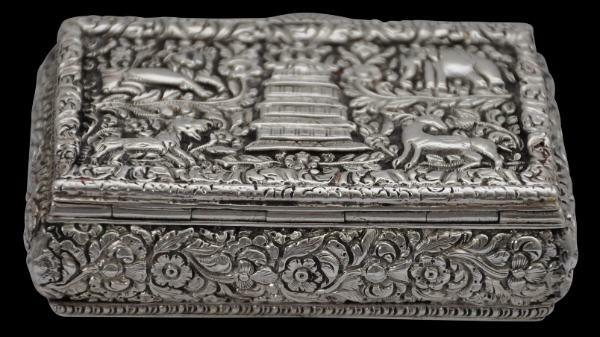 Similar silverwork was undertaken in nearby Tanjore. 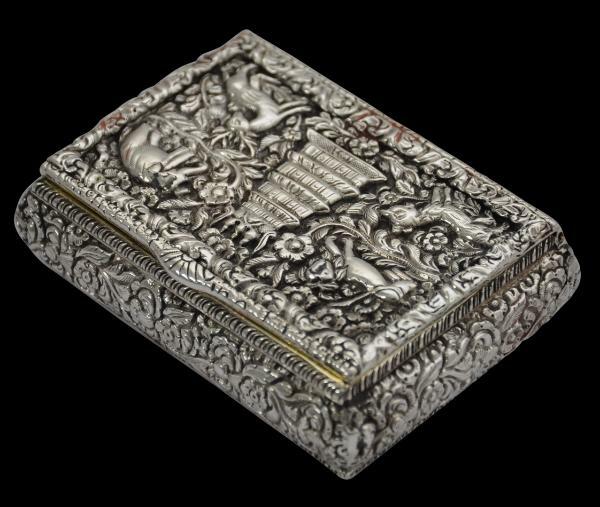 Examples of Trichinopoly and Tanjore silverwork are relatively rare among colonial Indian silverwork. This box is in fine condition. There is some age-related wear to the extremities. It has a fine patina. The lid fits well and tightly. Some of the corners have solder residue. A gopuram at the Chidambaram-Nataraja Temple in Tamil Nadu, south India. Photographed in December 2014.